Through and through, 2012 defensive line commit Matt Godin is a Michigan Man. Matt grew up in Fenton, MI and would often travel to Ann Arbor with his family for dining, entertainment and football. As a child, Matt was so passionate about Michigan football that he would sometimes "cry over games." Matt also heard a lot about Michigan academics while growing up, since his father, sister and brother are U-M alumni. So when the time came to declare his college of choice, Matt wisely evaluated his many options and selected the Maize and Blue. As he puts it, "Michigan is in my blood." Now that's Pure Michigan. "...Erik Magnuson, he's a great guy, and I recruited him since day one. I know [James] Ross, obviously - we both play in the Catholic League. Richardson and Royce, I know both of them; they're good guys...Our class is working really hard and will continue to work really hard to restore Michigan. We've all talked about it." "I want to play my freshman year. And they [the coaches] told me that there's a high percentage that I'm going to play my freshman year. I know a lot of schools just say that to kids to get them to go [to that school]...but they said they need someone who can come in and play on the D-line. Other than that, coach Jackson wants me to come down [to Ann Arbor] as much as possible next year to see the drills so when I get there [as a student-athlete], I'll already know how to do them." "We have the main position which I'm going to play, which is the 5-technique. I guess you'd consider it more D-tackle, but I'll also play outside...I'm only going to have one guy blocking me. It's more of an outside position, actually, but I'm going to be run stopping a lot, too." Interestingly, Matt is committed to wearing the same pair of shoes throughout a given football season, a practice he intends to continue at Michigan. At the very least, this will endear him to Denard Robinson - I would think. For a defense in need of big bodies, this 6'6'' 270lb Michigan Man is a welcomed addition. 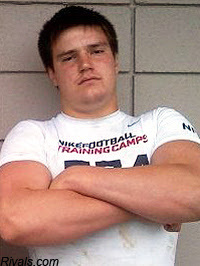 Currently, Matt is one of four 2012 defensive line commits, along with Pharaoh Brown, Mario Ojemudia and Tom Strobel. Just to clarify, the 5-tech is the SDE or SDT or whatever you want to call it. The outside DL that is beside the 3-tech DT. Correct? Is that the position where a tall guy like Matt is most likely to succeed? The 5-tech DE/DT is the strongside end. It's what Brandon Graham played in 2009 and what Van Bergen will play this season. The 3-tech is on the opposite side from the 5-tech. Godin is more likely to succeed at the 5-tech, but he could be a 3-tech as well. I prefer to keep the taller guys on the outside so the OT's reach advantage isn't quite so great, but 6'5" isn't too awfully tall to play DT. FWIW, I'm working up a post for Maize 'n' Brew about the different techniques. Perhaps that will clarify. Obviously it can vary based on the individual, but how tall is too tall in your opinion for DT? Pat Massey was 6'7 275-290 lb as a Senior and was routinely criticized my M fans for getting pushed back as a DT. Godin is listed as 6'6 on Rivals and will presumably add weight to his listed 270 lb. Not saying they're the same guy (and anyway, Massey wasn't a bad player) but it makes you wonder. I know its a different position, but I've read that many in the NFL now consider OTs over 6'7 to be 'too tall'. The whole 'low-man-wins' thing...it seems like 6'5 is too tall for an interior DT spot unless you weigh like 320+. Just saying that based on NFL player sizes. College obviously can differentiate further from the prototype, but even Will Campbell (6'5 330) is struggling to maintain leverage, though his issues may not be physical. When a DT gets 6'6" or above, I think that starts to push the limits. Obviously, a beast of a guy could be 6'6" and still be effective as a DT. But most guys who are 6'6" or 6'7" either become offensive tackles or defensive ends. From what I've seen, I think Godin is closer to 6'5" than 6'6". If he gets taller, though, I'd guess he would be more and more limited to DE. No matter how short you are, you're going to get knocked backward if you stand straight up. So whether Will Campbell is 6'5" or 6'1", bad technique is bad technique. You see short defensive ends like Brandon Graham and Dwight Freeney staying low and bending at the knees, and that's one reason why they're good at what they do. I think the OL thing might be cyclical. Defensive linemen were getting big, so offensive linemen got bigger to keep them at bay. Now more and more NFL teams are going to the 3-4 and using smaller, quicker rushers . . . so you might see NFL teams valuing 6'4" or 6'5" guys a little more, players who are a little more agile. I don't know what direction the NFL is going because I don't follow it as religiously, but that would be a logical evolution, I guess. 6'7" is basically the prototype for a LT. The only "great" OT I can think of off the top of my head that was over 6'7" was John Ogden at 6'9". Jake Long, Joe Thomas, Tony Boselli, Michael Roos and Orlando Pace all are/were 6'7". Anthony Munoz, probably the best LT of all time was 6'6". I can't wait for a team to finally break out the Midget rush attack and have 2'6" RBs run through legs the Defensive line in 3rd down situations. Since DT depth is such a hot topic, what would you project our line to look like if Godin and Pipkins made it in? Do you expect Godin to grow out of his spot down the road with all the other DEs we're taking? Mailbag: What will it take to get Bri'onte Dunn? Poll Results: Michigan's leading tackler in 2011? Poll Results: Michigan's Fastest Player? Poll Results: Starting running back in 2011?